A delicious and healthy gluten-free Chickpea Salad with Easy Lemon Dressing that takes less than 20 minutes to make! This isn’t your ordinary chickpea salad folks. This one is loaded with so many goodies that your taste buds will think they’ve turned into party poppers. Just take a look at the textures in that bowl. And the colors, oh the pretty colors. If you love Mediterranean food, then this gluten-free chickpea salad with kalamata olives and palm hearts salad is going to steal your heart. 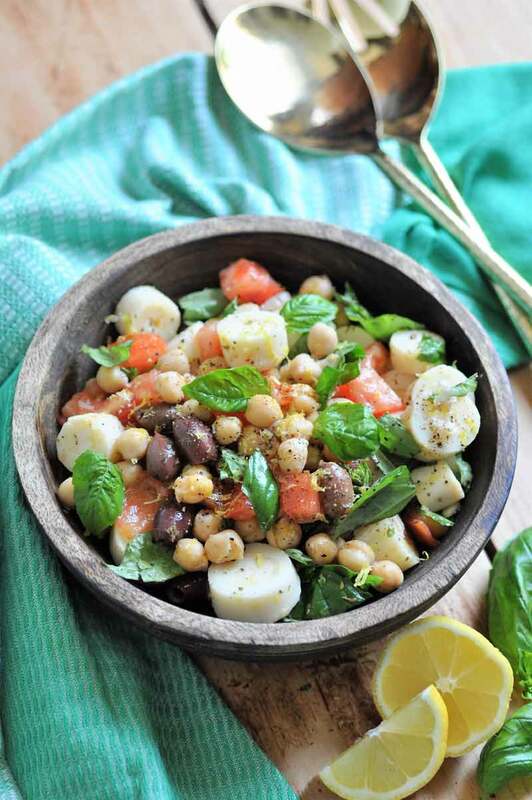 Every bite offers an explosion of flavor; there are big pieces of tangy palm heart, savory olives, juicy tomatoes, creamy chickpeas, and fresh peppery basil leaves, all topped with a tart lemon dressing that’s so easy to make. This isn’t just a salad, it’s a meal, and it’s a meal that takes less than twenty minutes to make. Now do I have your attention? It’s so easy it’s almost stupid. Almost. The only thing that prevents it from being a salad for dummies is that it’s so healthy and delicious, all the smart people will make it. 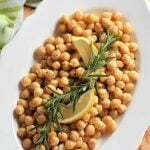 Make a batch of chickpeas or open two cans and drain and rinse off the brine. Keep the brine, aka aquafaba, and make these. 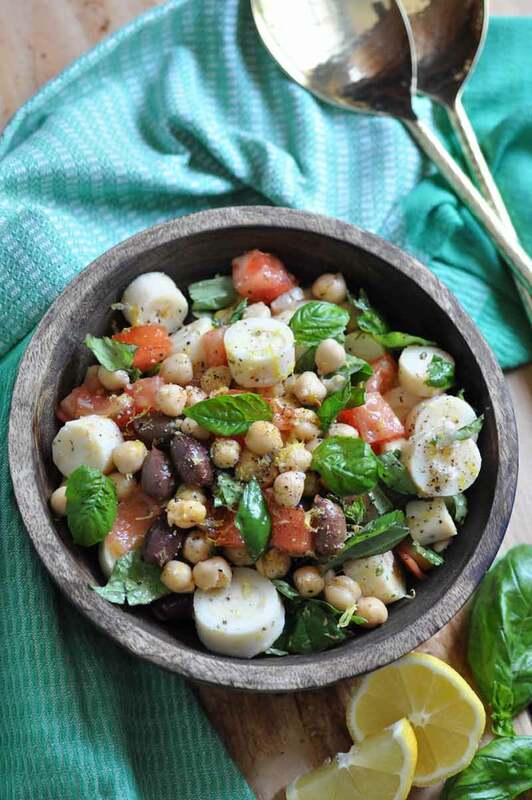 Slice the palm hearts, Dice the tomato, Chop some fresh basil, and toss them in a large bowl with the chickpeas. Whip up the lemon dressing and fold the chickpeas, palm hearts, tomato, basil, olives, and dressing together until combined. Grate some fresh lemon zest on top, sprinkle some pink Himalayan salt over the salad, and add freshly ground black pepper to taste. NOTE: Don’t skip the lemon zest, it makes the salad! See, I told you this was super easy. 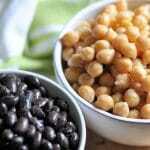 HOW DO YOU COOK DRIED CHICKPEAS? Rinse then soak. They must soak for at least six hours before you boil them. They will expand as they absorb the water. Boil for approximately 90 minutes. Once you’ve rinsed the beans, put them back in the pot and cover with several inches of fresh water and bring to a boil. Reduce the heat to a low boil and cook for approximately 90 minutes, or until the beans are the texture you desire. To learn more about cooking dried beans, click here. WHAT SHOULD I SERVE WITH A CHICKPEA SALAD? Serve it with a warm and crunchy baguette and some crisp white wine for the perfect summer comfort food dinner. This Vegan Tomato and Spinach Tart could be the main course and the salad would make a lovely side dish. These “Honey” BBQ Ribz would be awesome with it. And don’t forget to make enough so you can have some for lunch the next day. A healthy and fresh salad that is hearty enough to make a meal. 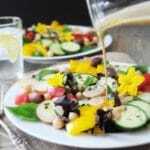 Filled with protein packed chickpeas and Mediterranean vegetables, with a bright and tangy lemon dressing. 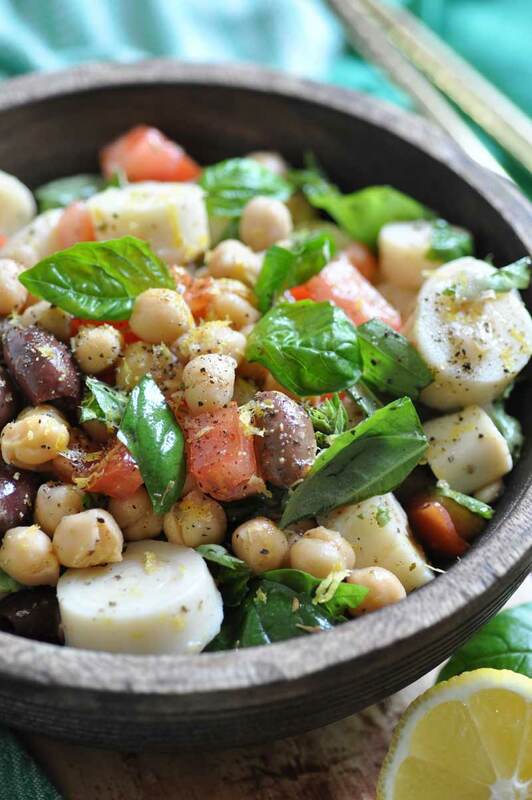 In a large bowl, fold the chickpeas, palm hearts, tomatoes, olives, basil, and dressing together until combined. Grate the lemon zest on top, sprinkle a thin layer of the pink Himalayan sea salt over the salad, and add black pepper to taste. Don't skip the lemon zest, it makes the salad. 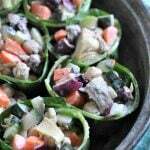 This salad looks wonderful, love the flavors and addition of hearts of palm. Can't wait to try, thanks! 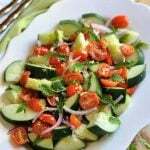 You have so many of my favorite ingredients in this salad! In fact, I think I already have everything I need to make it! Yay! Let me know what you think if you make it. This looks delicious and so simple to throw together! Thank you! It's such an easy salad. I love chickpeas, and especially in my salad. This sounds so good especially in the heat of the summer! Tangy and salty and yum! Thank you, Sophia! It's getting me through the heat and humidity Chicago is experiencing this week. Oh yum! This looks so good and refreshing! Yum! This salad recipe is pitch-perfect and the dressing is just awesome. Can I use lime zest instead of lemon zest? Hi Agness! Thank you so much. You could use lime zest, and if you do I'd change the dressing to a lime dressing so the flavors don't compete. Hey Lynn, We're so happy you found us too! 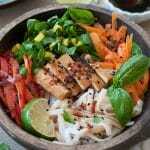 With switching to plant based, keep in mind that plant foods are less calorically dense so eating a larger quantity of whole plant foods is a must : ) We're so happy to hear that you've decided to continue with a plant-based lifestyle and would love for you to reach out again if you have any questions or need support in your plant-based journey! The whole recipe makes about 4-5 servings, but if you're eating it as a meal we encourage you to eat until you're satisfied and disregard serving sizes for whole-food-plant-based meals for the start of your plant-based journey. Let us know if you have any more questions and thanks for the comment!